Distribute rich content to any platform, app or device. The Power of Corona. Playing Everywhere. 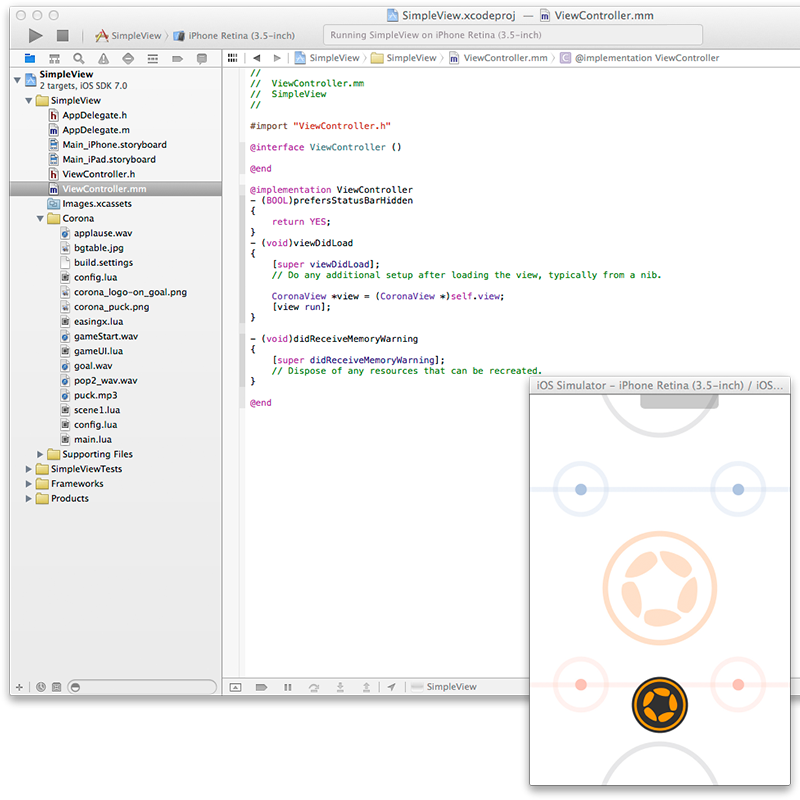 Corona SDK is known for quickly building rich games and apps. We've taken these strengths and brought them to all native apps. CoronaCards was designed to be added to existing native apps - it can be embedded in an existing app structure, so it does not control or own the main application stack. There's complete flexibility: show CoronaCards full or partial screen, or even as an overlay. See what you can do! Have an app that would benefit from a little richness? Corona has 1000s of APIs: everything from multi-touch to physics to shader-based filters. Bring this power to your existing apps and add visualizations, interactivity, image editing or any 2D/2.5D graphical element. All Corona content will work equally well on any supported platform. Adding CoronaCards to your native app is done in just a few steps. See how easy it is. And once you drop it in, the magic starts. Corona is renowned for fast development and that remains true with CoronaCards. Our APIs eliminate complexity: with a few lines of code you get OpenGL-based graphics, audio and physics and much more. Supercharge your apps with Corona. Looking to improve your apps while leveraging your investment and code base? With CoronaCards you can layer rich, interactive content onto your existing apps. Want to monetize your direct-sold or premium inventory more effectively? Imagine super-rich, native advertising. Banners, interstitials, sponsored areas and more. All made possible with CoronaCards! We are working with selected partners. Tell us what you need and we'll be in touch. All Corona-based content is completely cross-platform and its capabilities have been proven at scale in more than 30,000 apps. Engagement, conversion rate and eCPMs at a whole new level. Get ready for mobile ads like you've never seen before. 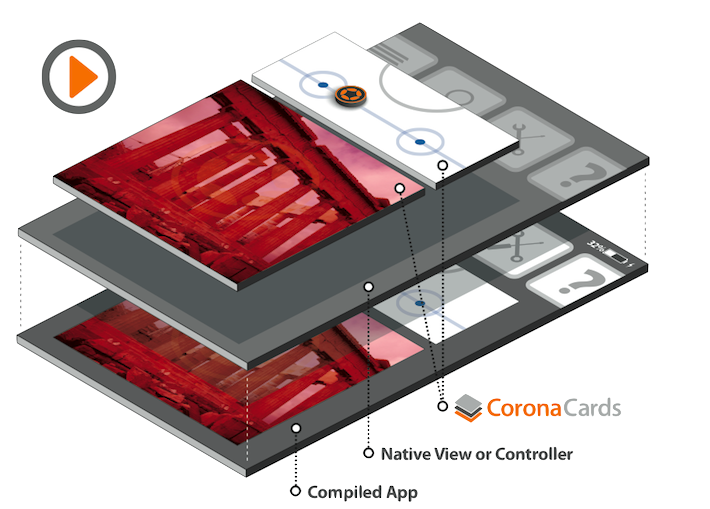 Corona's native capabilities and performance are perfect for creating immersive experiences. Whether it's a CPI ad, a native ad or a brand awareness campaign, it's much better with CoronaCards. Add Corona to the mix! We are working with selected ad network partners. Interested? Can your ads do physics, Instagram-style effects, social sharing and 60 frame-per-second animation? Do they include analytics to measure how they are used and how well they work? All that is possible with CoronaCards. Best of all, these ads will work equally well on iOS, Android and Windows Phone. Integrating CoronaCards into a publisher's app is as easy as integrating any ad network SDK. And once you drop it in, the magic starts. For advertisers, authoring super-rich mobile ads is extremely easy. We have tools that make it as easy as drag and drop, without any coding, and a large and growing community of Corona experts that can lend a hand. And the size of a super-rich mobile ad is no larger than that of a video ad or a mere "rich-media" ad. © 2018 Corona Labs, Inc.
CoronaCards™ is a product of Corona Labs Inc. The Appcelerator, PhoneGap, Unity and Xamarin products and trademarks belong to their respective owners and are not affiliated with Corona Labs.